If you want to shop for clothes online but do not know which is a good site, look no further because here are the best online fashion boutiques every woman should take note. If you have not bookmarked these awesome sites, it is time to do so! An elegantly done shopping site, Twenty3 was born from Sherlyn Tan’s love for fashion. With the support of a wonderful group of customers, Twenty3 has since grown to be one of the largest online fashion retailers in Malaysia, reaching people from all over the globe. If you are looking for gorgeous bridemaids dresses, fashionable tops, bottoms, dresses or work wear for your own, Twenty3 is the place to shop. Oh, did we mention they also provide tips and tutorials? Doublewoot is a Malaysian-grown fashion label specializing in producing and launching high quality women’s work and casual apparels. Since 2005, Doublewoot has produced and shipped over thousands of designs all solely manufactured in own factory based in overseas. Doublewoot launches a new collection once or twice weekly. Other coveted collections includes the Bridesmaid Collections, Chic Formal Work collections. Officially established in year 2011, KEI MAG aims to redefine a new online shopping experience to all potential customers with top quality of goods, leading trend of fashion and exceptional customer service. KEI MAG addresses fashion and trend conscious consumers of all ages through few distinct product lines: clothing, personalized jewelry, bag, outfit and accessories. Off The Rack Asia is a great platform for fashionistas! Mix and match items to create your own individual sets which you can share with your friends. 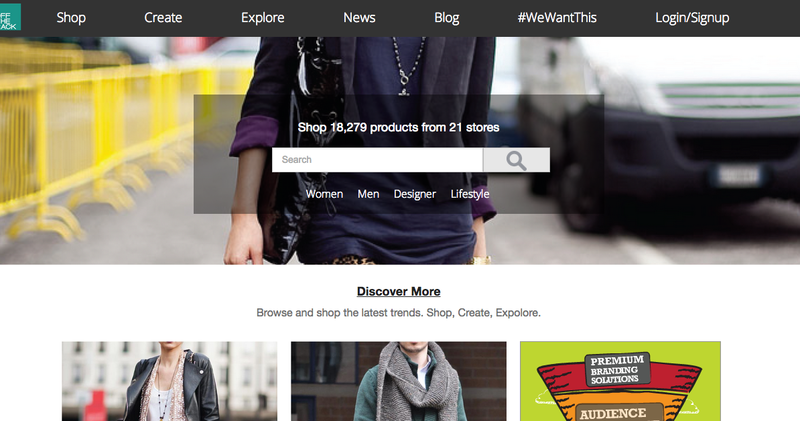 Also explore created sets by the Off The Rack Asia community and be inspired. Shop from over 5000 styles from your favourite online shops, including designer dresses, branded handbags, high heels, maxi dresses, necklace and earrings. Off The Rack Asia combines the top online shops from Malaysia and Singapore; Gatto.com.my, Luxola.com, Mivva.com, Nelissahilman.com, Offtherack.my, Redsrev.com, Reebonz.com.my, Shopkissandtell.net, Sometime.com.my, Zooq.com, 7ltd.co . Created by three bold and beautiful fashionistas, this brand new Malaysian fashion label is set to take the local fashion scene to another level with their gutsy aspiration of establishing its very own local and international flagship stores. 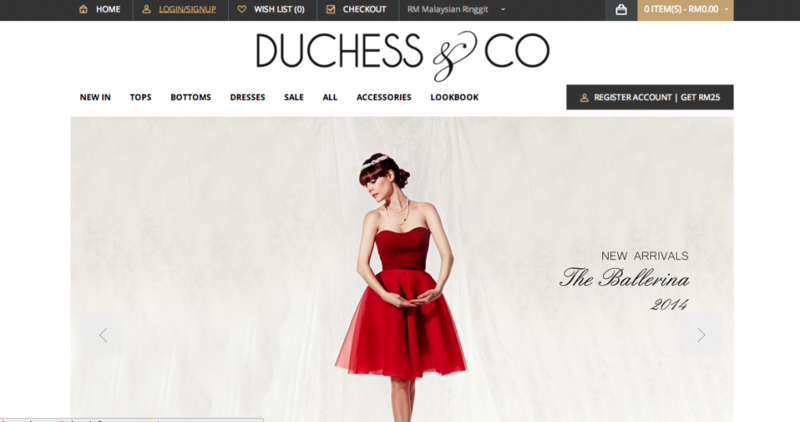 Not only does Duchess & Co captures the latest trends but offers timeless, classy collections of dresses, skirts, blouses and trousers – with a modern twist. It uses its vintage expertise that comes with tremendous statement and classic print to create a wide-range of designs. Do visit them physically at 17-1, Jalan Telawi 2 Bangsar Baru, Bangsar. Azorias’ merchandise are made in Korea. Its merchandizing team personally flies down to Korea to handpick its products. First online site in Malaysia dedicated to premium workwear, being your go-to destination for stylish work attire that won’t break the bank. Surely starchy collars and drabby black skirts can’t be the only answer to workwear! Not sure what to wear for an event? Wondering whether your body type is suitable for a certain of clothing? Try out Azorias Style Advisor at no extra charge. Curves Boutique proves website may not be necessary. Yes, they run on Facebook. From pretty dresses and party frocks to sharp outer and hot jeans, not to mention fabulous shoes, bags and accessories; Curves Boutique features individually picked, deliciously different fashion and serves up the perfect mix of hottest designs from all around Asia. Curves Boutique releases new designs almost every week to provide the most current trends. Back in the year 2008, online shopping was still in its infant stage and there just wasn’t a lot of choice online. A young fresh graphic design graduate, back then, spurred on by her desire to get some much needed retail therapy and after months of intensive research, Peep was born! With the help of friends, family, sisters and customers, Peep managed to grow the brand to where they are today and hope to continue to fulfill each and every girl’s need for Chic & Cheeky clothing through the convenience of online shopping! 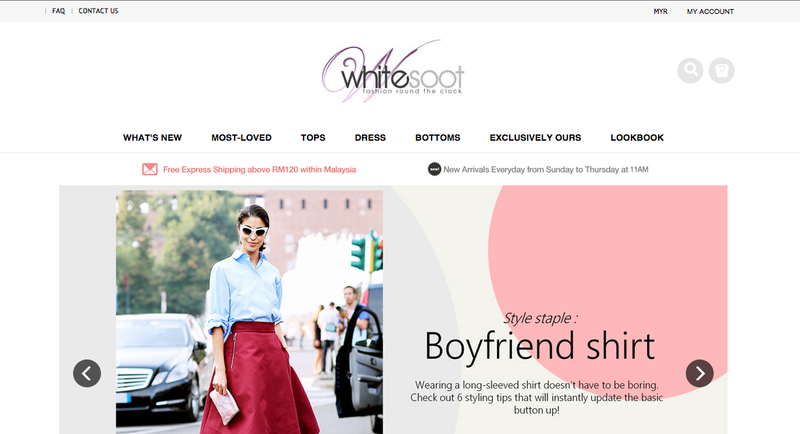 Whitesoot is a premier online shopping store in Malaysia that aims to bring the glamour of fashion to life’s daily grind 24/7. Whiteshoot hand-pick’s items not only for its style and quality but for its’ affordability and practicality as well. Whitesoot doesn’t believe in spending a fortune for fashion, instead, we rather fashion look like a fortune. Inspired by fashion bloggers, everyday fashionistas and the fashion runways of the world, Whitesoot offers stylish and elegant clothes for a variety of occasions. There’s something for the office, that party on Friday night, that casual trip to the shopping mall and even for the usual Sunday chill-out sessions with the girlfriends. 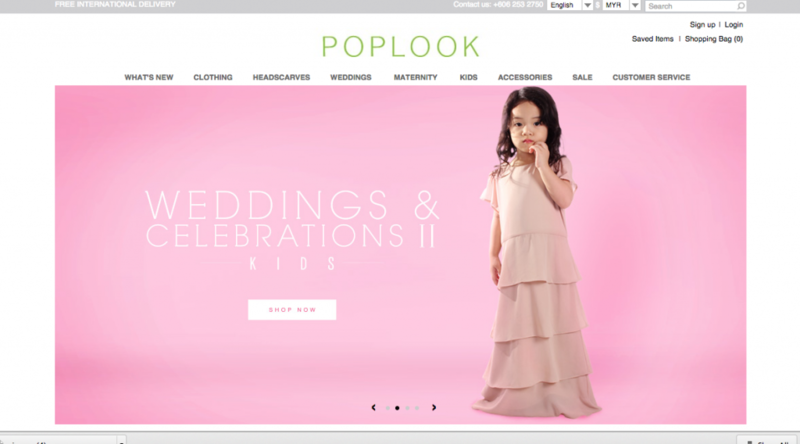 Launched in 2009 as thepoplook.com, and rebranded in 2014, POPLOOK is Malaysia’s leading online store specialising in modeat Muslimah Fashion. February 2011 saw the launch of their in-house label, POPLOOK began providing specially designed and carefully manufactured pieces exclusive to the POPLOOK STORE at affordable prizes coupled with excellent customer servce. POPLOOK pieces are available in size S – 4XL and also in Regular and Tall lengths. POPLOOK emphasizes versatility in classic cuts while staying up-to-date and incorporating current trends.